PHILADELPHIA, PENN. (November 16, 2017) . . . Doug Glanville, former Major League Baseball (MLB) player, baseball analyst/commentator, and author, today announced that he will be teaching at the Annenberg School for Communication at the University of Pennsylvania as a Lecturer. Starting in the spring semester of 2018, Glanville, an alumnus of the University, will teach an advanced level communications course titled “Communication, Sports, and Social Justice.” The course will bring together Glanville’s connection to sports, broadcast media and writing skills, and passion for supporting causes of social significance. “Doug brings experience – pure and simple. He is fair and looks at both sides. I’ve seen him make the best of all situations. He blends his experience as a professional athlete, journalist and social advocate. This new course is the perfect intersection of his passions. Not only will Doug bring his amazing intellect, but he will effectively represent the opportunities and challenges we all face in the world of professional sports as we tackle issues that confront our society. He teaches us all valuable lessons,” says Adam Jones, first round draft pick, five-time MLB All-Star, four-time Gold Glove Award winner, Silver Slugger Award winner, and current center fielder for the Baltimore Orioles. This unique course will examine the relationship between sports, celebrity, and the power to communicate for social justice. 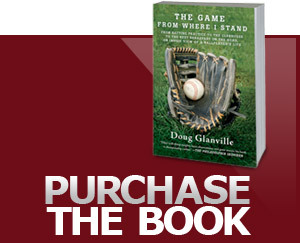 Through case studies, review of current events, and empirical evidence from Glanville’s own experience, students will learn to evaluate the patterns and strategies that athletes have employed to elevate an issue. The course will help students develop a critical eye for communication approaches and how well those tactics yield the desired changes. The undergraduate class is open for registration by students who are enrolled at the University of Pennsylvania for the spring 2018 semester. Glanville’s appointment as Lecturer comes after several years of community advocacy work and engagement of the legislative body in the State of Connecticut. Glanville has been an outspoken supporter for race equity and inclusion, particularly where it intersects with community policing. In 2014, Glanville sparked conversations about extra-jurisdictional engagement and the volatile line between racial profiling and cultural competence, after writing about his exchange with a West Hartford police officer who stopped Glanville for questioning in his driveway in Hartford. Glanville continued this theme of discussion after he was emphatically denied taxi service at LAX in 2015. Glanville wrote about these two separate experiences in The Atlantic where he offered thought-provoking perspectives on situations that many people of color encounter daily. Glanville has turned his upsetting encounters into community discussion and productive collaboration which has led to a new law in the State of Connecticut and a comprehensive policy change at LAX. As a way to continue his sustainable impact, Glanville works on issues surrounding the problems associated with categorically dismissing clear undertones of disrespect and racial bias, as well as the detrimental consequences of criminalizing those accused of “fitting the description” through his work with the Police Officer Standards and Training Council (POST). Glanville is excited to start a new chapter in his career and feels that UPenn’s Annenberg School is the perfect fit, “I would consider it a great success if I can inspire communication that is reciprocal and team-centered through my life’s passion for sports and social justice. If my instincts are correct, the tools one can gain from openly discussing expression through sports can serve as a proxy for addressing inequities in a diverse society.” Glanville hopes that students will emerge from the course as leaders who embrace the enduring benefit of developing qualities that result in patient, critically thoughtful, and inclusive engagement. For a complete course description, please visit the Annenberg School for Communication Undergraduate Course Descriptions.